Gov. 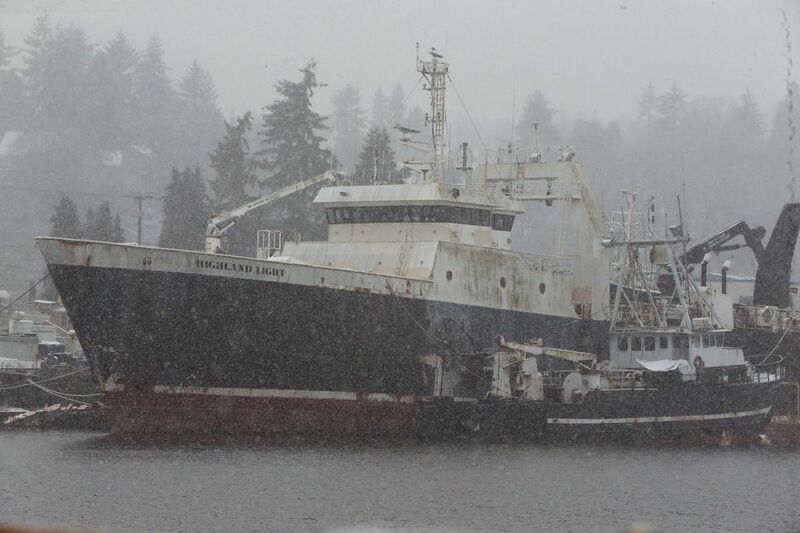 Jay Inslee declared a state of emergency as the second snowstorm in a week hits the Puget Sound region. 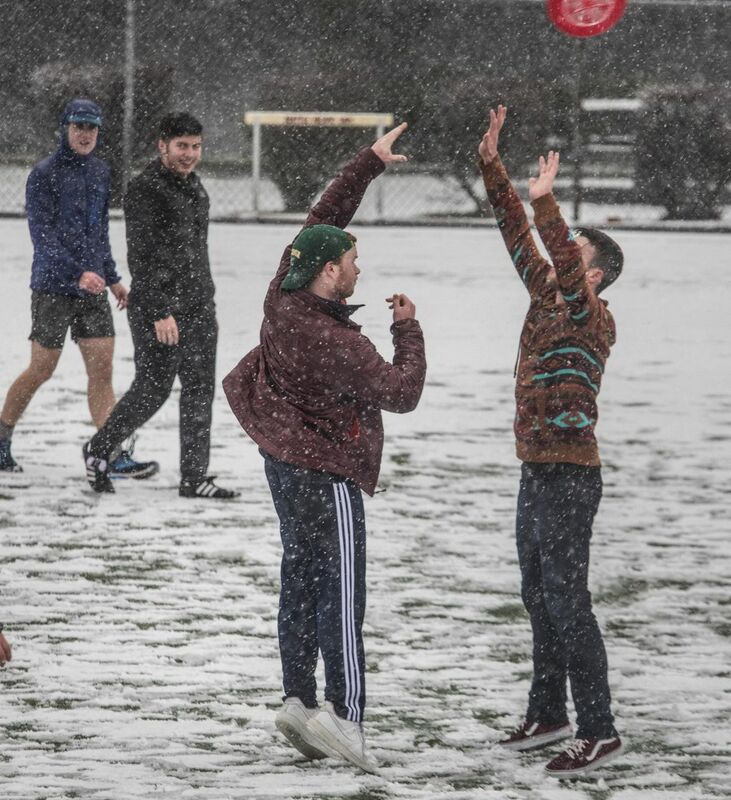 Editor’s note: This is a live account of updates from Seattle’s snowy Friday as the events unfolded. A full recap and outlook for the weekend is available here. 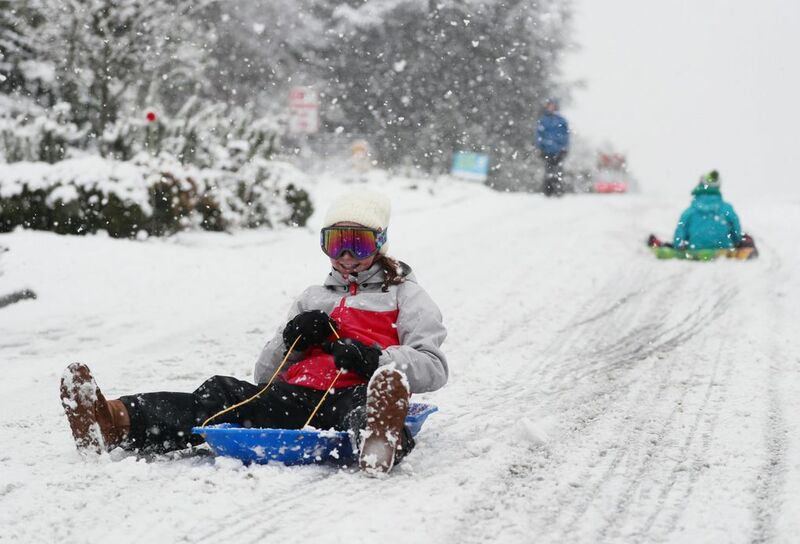 As much as 6 inches of snow in the lowlands is expected, according to the National Weather Service in Seattle. It started falling Friday. 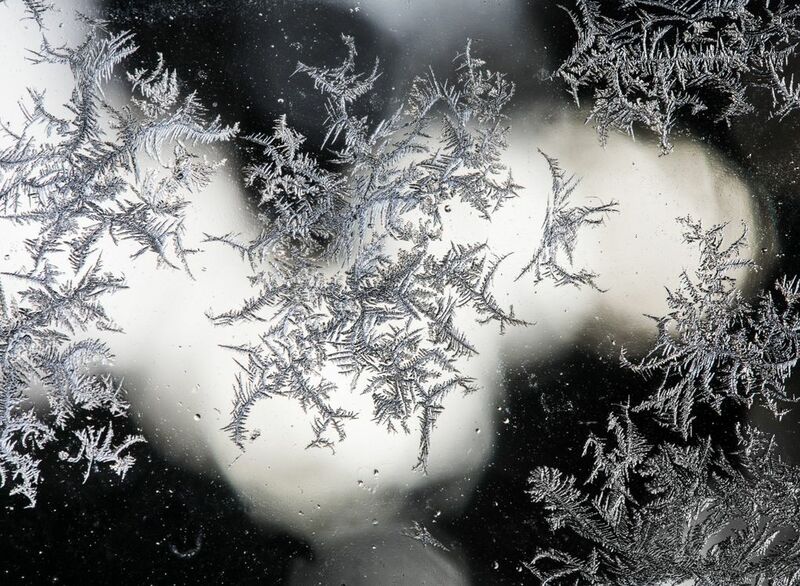 Snow is expected to last with high temperatures on Saturday, Sunday and early next week predicted to remain in the low to mid-30s, and the overnight lows in the teens or 20s. Gov. 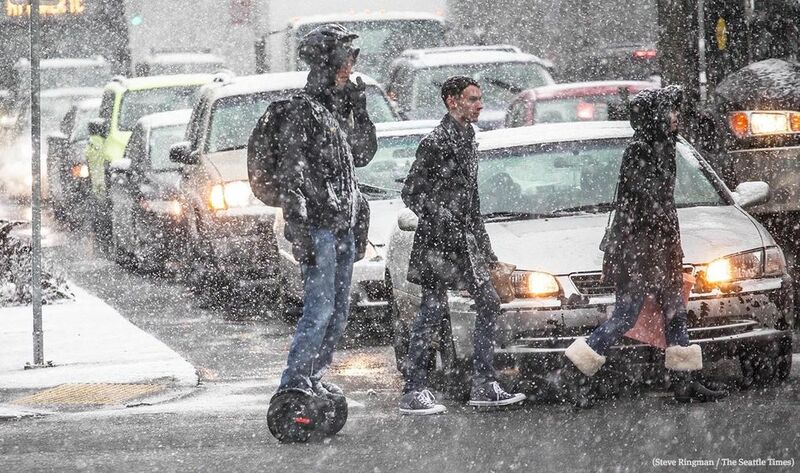 Jay Inslee has declared a state of emergency throughout Washington in response to the snowstorm. 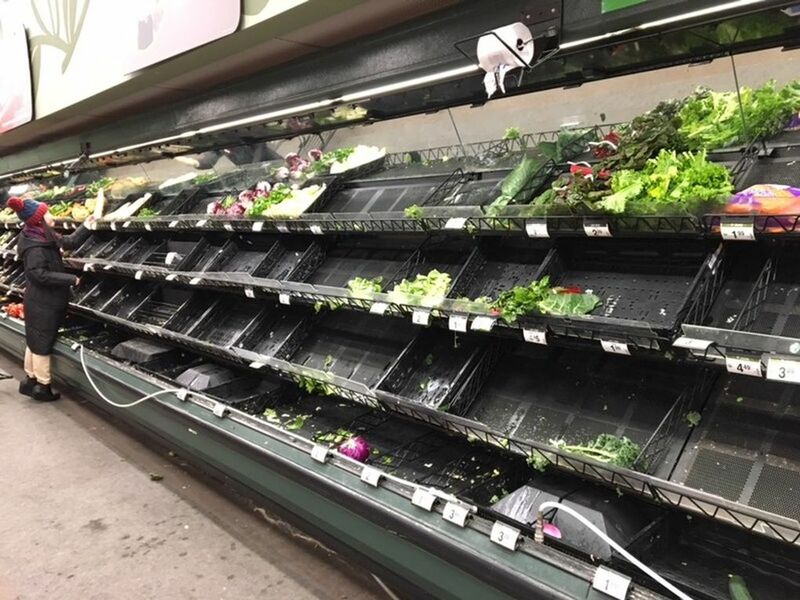 King County Metro has urged people to make alternate travel plans and canceled 20 bus routes Friday morning ahead of the storm. 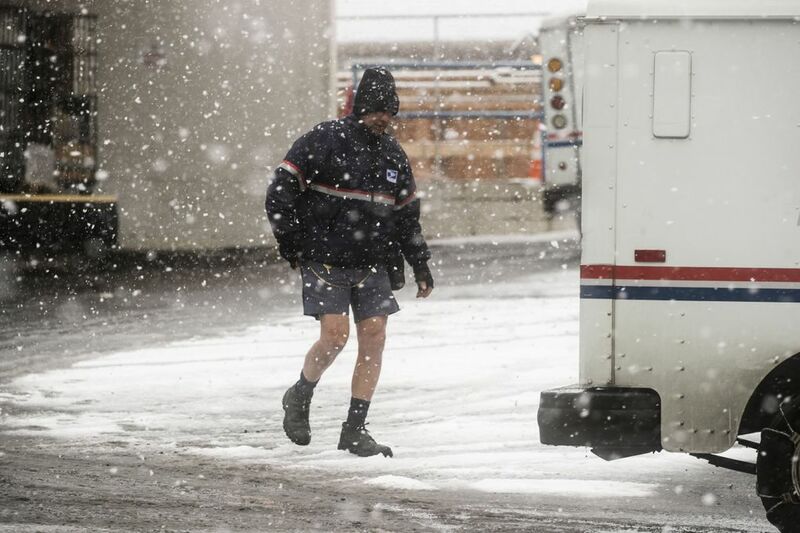 It plans to shift buses to snow routes at 2 p.m. Friday. 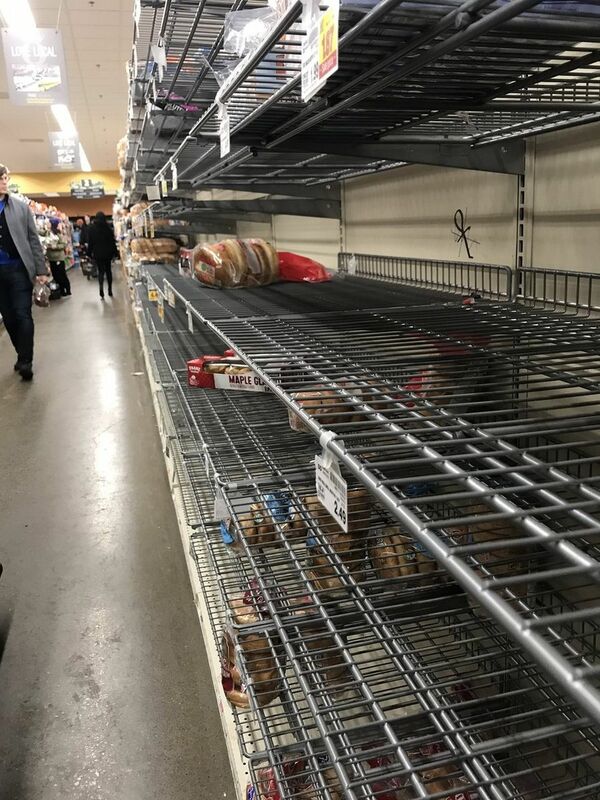 Many area offices, delivery businesses and schools, including the Seattle, Tacoma and Edmonds school districts, the University of Washington in Seattle and Seattle University, indicated they are closing early. 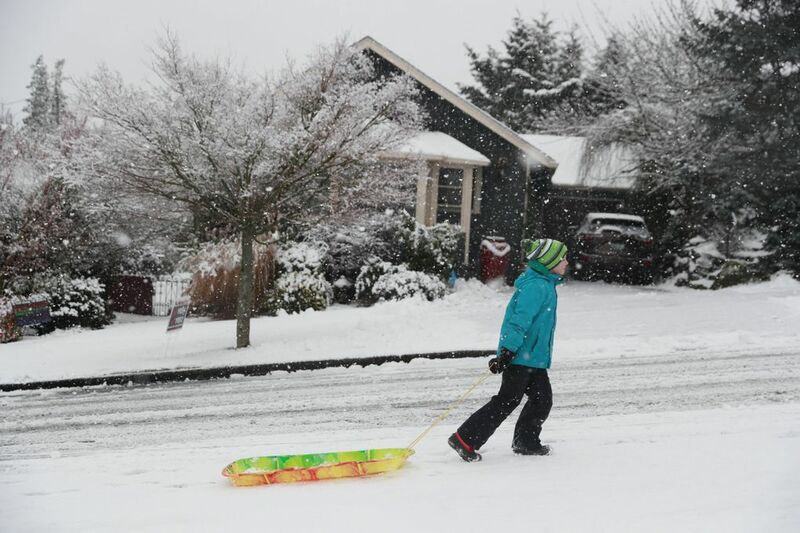 With more snow forecast overnight, traveling through the Seattle area may be difficult Saturday. King County Metro Transit will reduce its bus network to 60 high-ridership routes beginning Saturday at 4 a.m. A full list is available here, and a the map is available here. 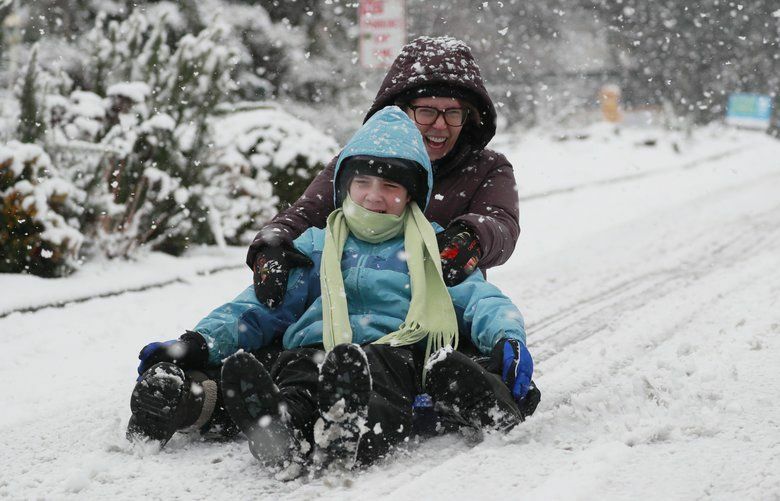 Harper Luthi, 11, and his mother Hilary Luthi sled near their home in West Seattle Friday, Feb. 8, 2019. 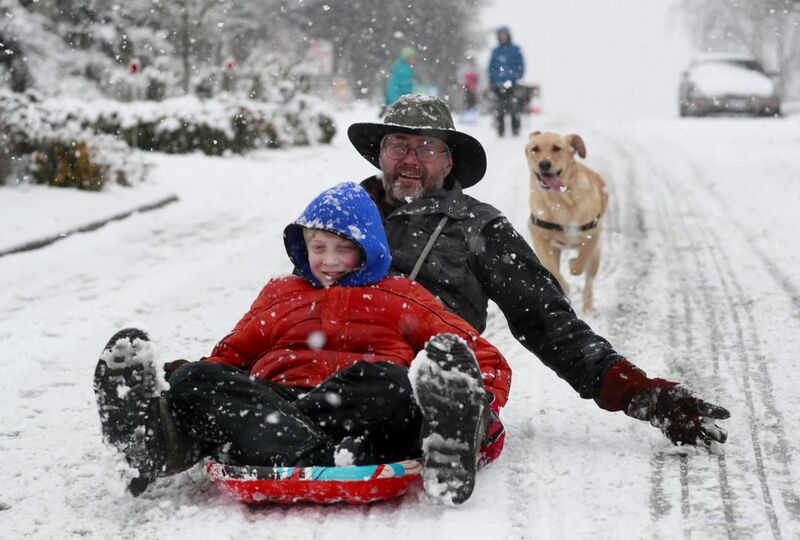 The amount of snowfall has varied widely throughout the Puget Sound region, according to the National Weather Service. 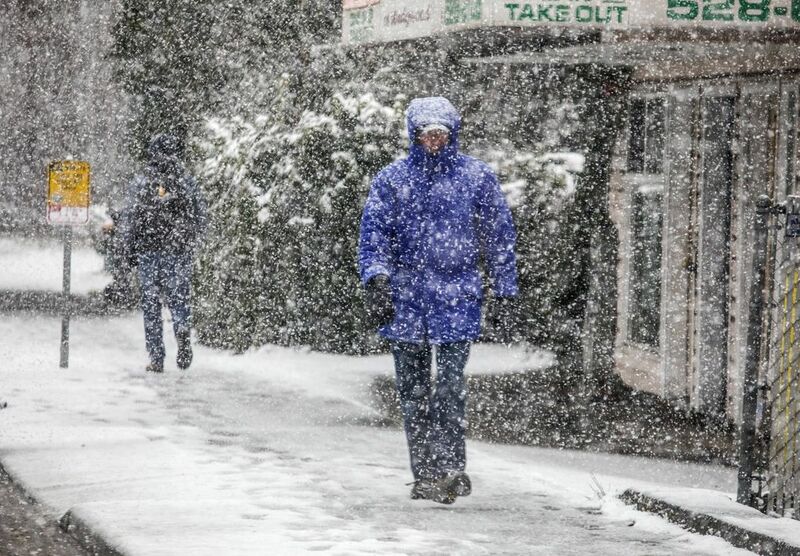 About 8 inches of snow had fallen in northeast Renton by 5 p.m., and 6 inches was reported in Burien at 5:30 p.m.
At Sea-Tac, 4.2 inches of snow had fallen by 7:20 p.m. More than 300 flights were delayed and 219 were cancelled because of the snow. 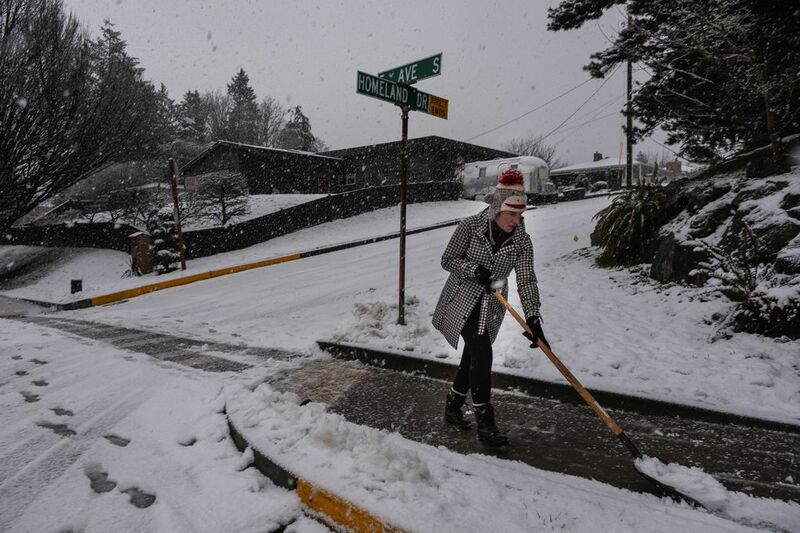 Additional moisture from the Pacific Ocean will lead to more snow overnight across the region, the weather service said. About 1,540 Puget Sound Energy customers are without power in Issaquah, according to the energy utility. Outages have also been reported in Renton, Auburn and Redmond. If you power goes out, do not burn charcoal or use gasoline generators indoors. Burning charcoal or using gas or kerosene heaters can produce deadly carbon monoxide. The Seattle Times, in cooperation with Public Health — Seattle & King County, created a notice to warn local residents about the dangers of carbon monoxide. A printable version is available here. Here’s more information on what to do if the power goes out. Travel times have improved to the point where most commutes will take less time than usual, thanks in part to an exodus of commuters earlier this afternoon. But transportation officials are cautioning that road conditions can rapidly change and may become icy as temperatures fall tonight. For bus riders, King County Metro Transit will reduce its bus network to 60 high-ridership, low-slope routes beginning Saturday at 4 a.m. possibly for several days until further notice. 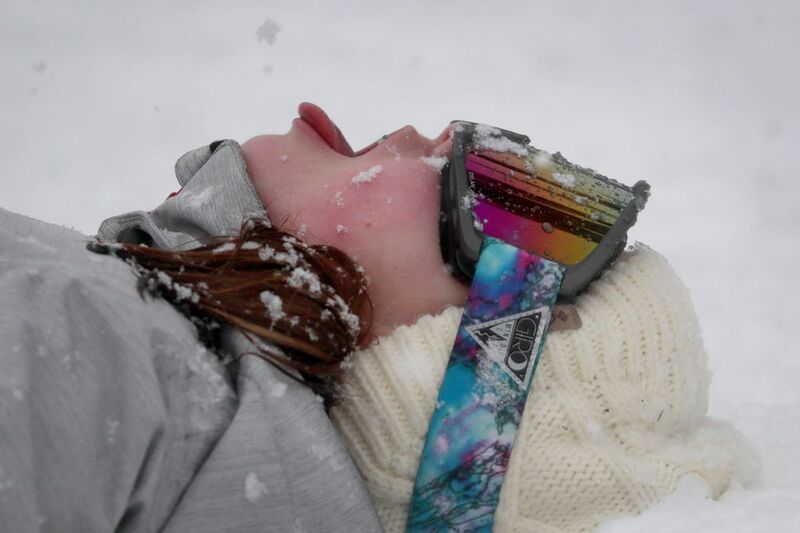 Many will also be on snow detours. For instance, Kirkland’s Route 252 will end at Totem Lake, where riders can catch a shuttle bus for the last 2 miles through Kingsgate to the Brickyard Park & Ride. West Seattle’s RapidRide C Line goes diagonally through the Fauntleroy Way triangle, instead of down steep 35th Avenue Southwest alongside West Seattle Stadium. A special snow-only Route 90 shuttle will circulate through Capitol Hill and First Hill without dropping into downtown. 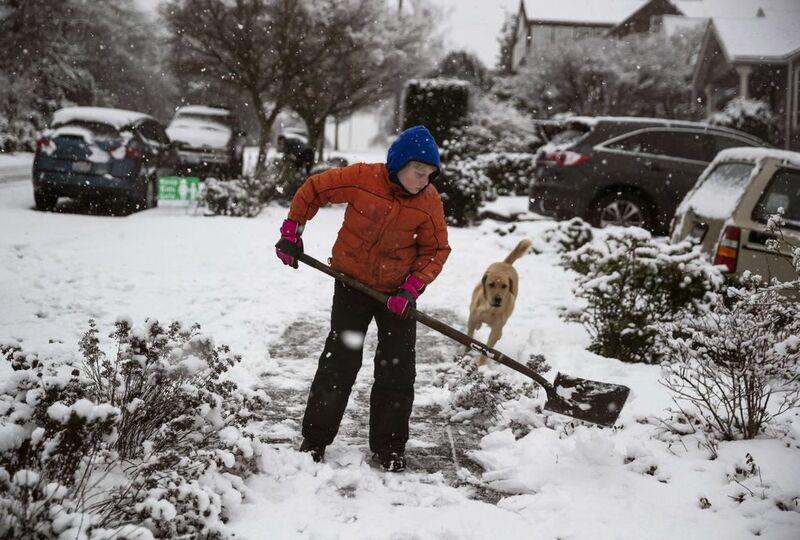 Meteorologists had predicted up to 8 inches of snow in the Seattle area from Friday to Saturday, but now accumulation is expected to be around 4 to 6 inches from Everett to Seattle, and maybe even down to Tacoma, said weather service meteorologist Kirby Cook. 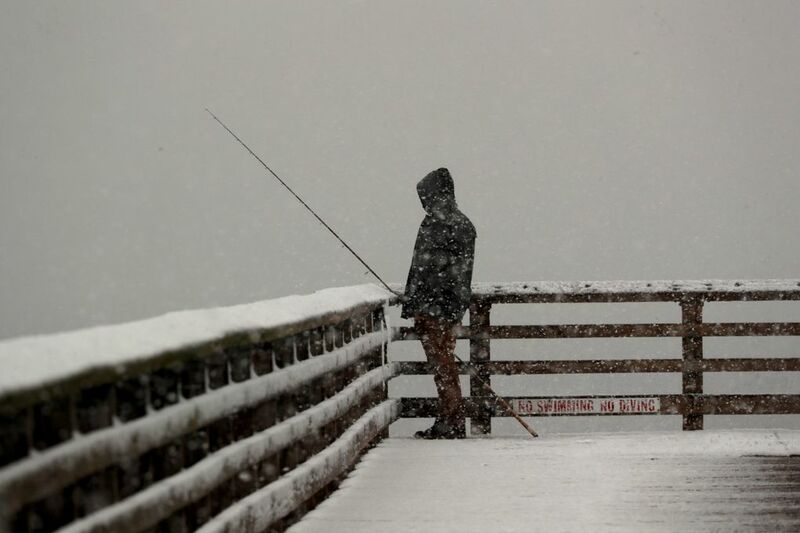 Parts of the northern Olympic Peninsula had already seen up to 8 inches of snow by 3 p.m., and may get another 4 or 5 inches tonight, Cook said. Visibility at Sea-Tac is less than 1/4 of a mile with 3 inches of snow reported on the ground, according to the weather service. 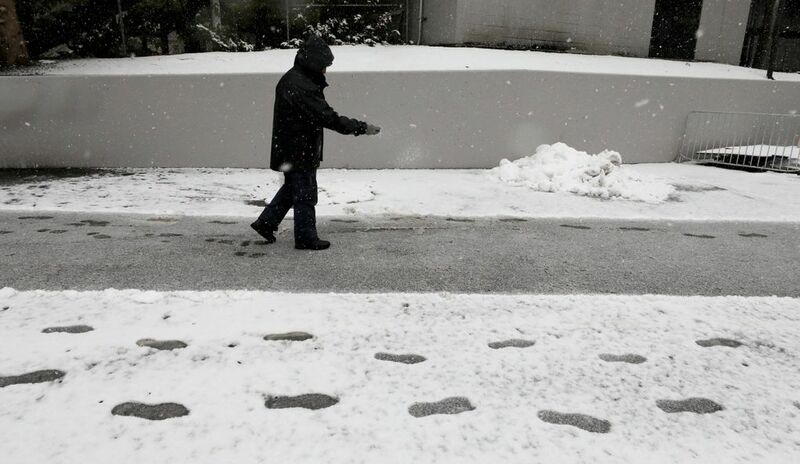 Airlines have cancelled 213 flights and delayed 213 others because of the weather conditions. Pets can get frostbite, and short-haired dogs may need a coat or sweater while outside, according to Seattle Humane, an animal shelter. 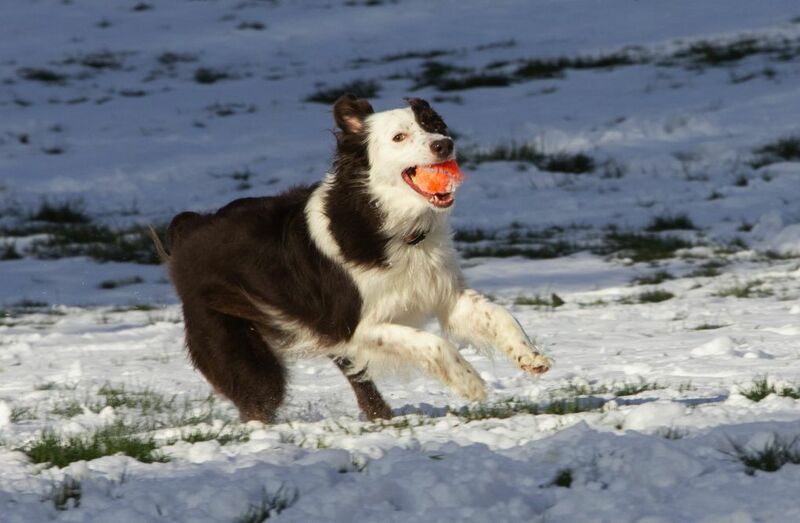 Owners should increase their dogs’ food supply as they are working harder to stay warm when exercising outside. Coolant and anti-freeze, which can spill in garages or on the street, are lethal to dogs and cats, so make sure to wipe off paws, legs and stomachs when coming in and out of the snow. Outdoor cats often climb under the hoods of cars for warmth, so bang loudly on your car’s hood before starting the engine so the cats have time to get out. More tips are available here. A band of heavier snowfall is moving across Edmonds and Lynnwood, heading across Interstates 5 and 405 toward Snohomish over the next hour, according to the National Weather Service. Snow showers are also moving east across the Gig Harbor area toward Tacoma, Federal Way, SeaTac and Auburn for the next 60 to 90 minutes. Commute times on southbound routes from Seattle are still longer than usual, but improving. 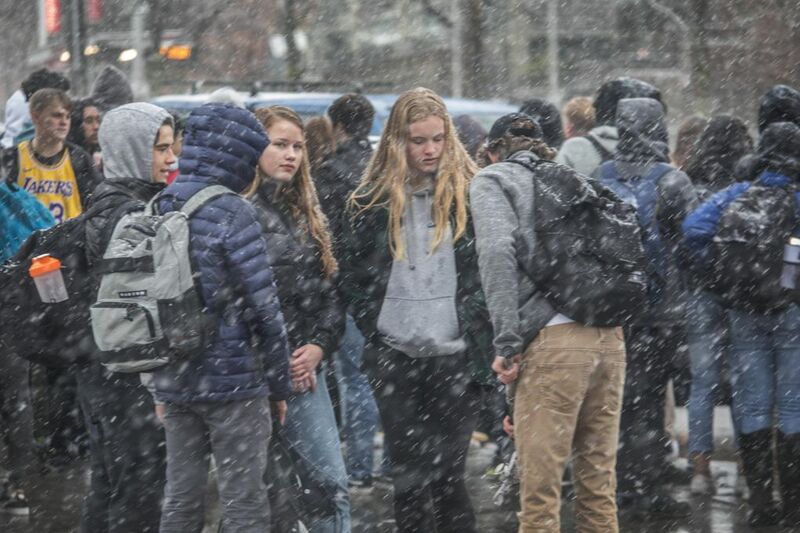 Another band of moderate snow is moving through downtown Seattle, increasing snowfall rates for another hour, according to the National Weather Service. Travel times have improved north of Seattle in both directions and are even faster than usual for some routes. 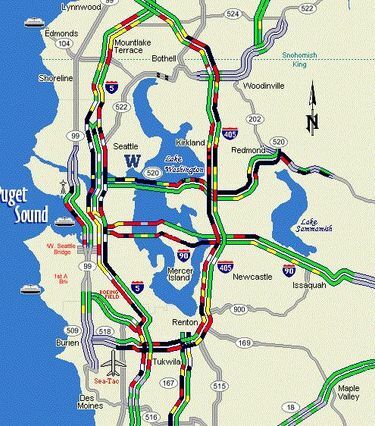 The snow continues to snarl traffic heading south of Seattle; the drive to Renton is 62 minutes and to Federal Way is 90 minutes. Leave early if you’re heading to Sea-Tac, as the drive from Seattle is more than an hour. 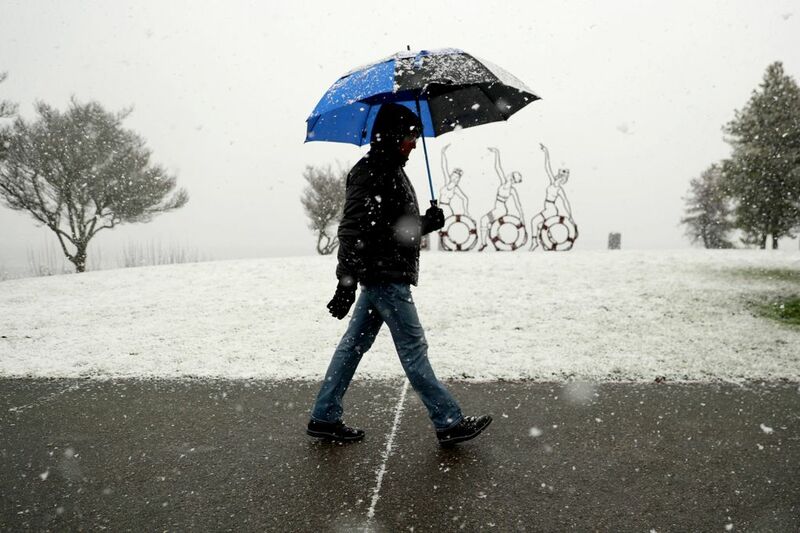 About 1 to 3 inches of snow fell across the Seattle area during the first round of snowfall Friday afternoon, according to the National Weather Service. 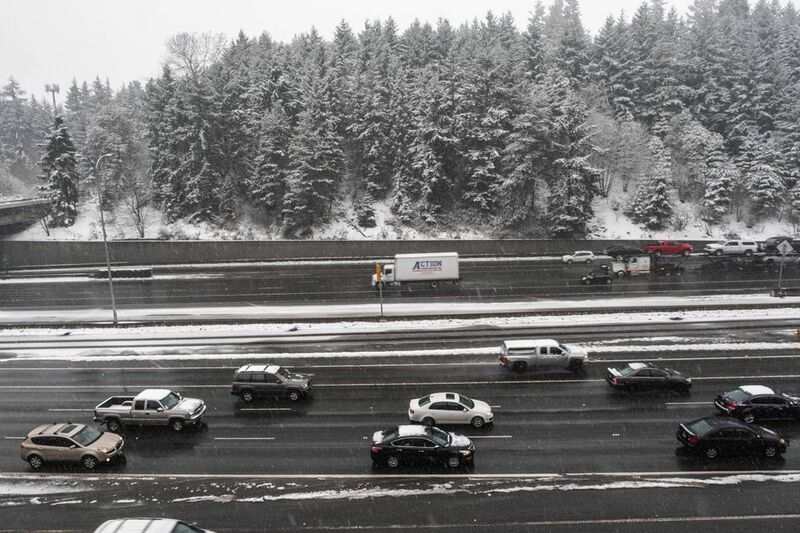 The snow has temporarily dissipated along Interstate 5 from Seattle to Everett, but is forecast to pick back up within the hour. Traffic continues to move at a slow pace, with many buses operating on snow routes. There have been 192 flight cancellations and 192 delays at Seattle-Tacoma International Airport. In Edgewood, Pierce County, a woman was rescued from a pond by sheriff’s deputies and police officers after she fell through ice. The woman was walking her dog on the pond when she fell, then climbed onto a log and yelled for help, according to the Pierce County Sheriff’s Department. The Edgewood police chief went onto the ice using a board and pulled her to safety. The early exodus of commuters is taking a toll and forcing some transportation providers to adjust on the fly. Bus riders should be prepared to be patient. King County Metro bus routes are running with reduced frequency, as they have been during snowy and icy conditions for much of the week. Metro is operating with about 65 percent of its peak commute fleet, down from about 75 percent Wednesday, said spokeswoman Torie Rynning. Among the challenges facing Metro is damage done to buses by snow chains. During recent weather, Metro had 400 coaches damaged in some way, Rynning said. Metro crews are now “spending their time chaining vehicles at bases instead of repairing them, prioritizing safety and reliability of the coaches that will be in service,” Rynning said in an email. But bus drivers are frequently passing up people, including some on Third Avenue. 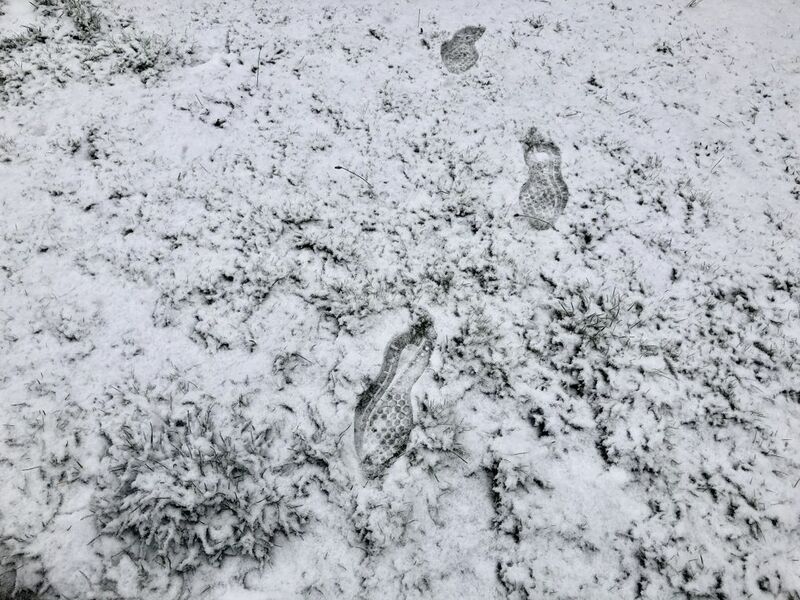 Among affected routes are the 28 Express, where some riders chose to give up and walk. Sound Transit has added an extra midday Link light-rail train to accommodate more passengers. The West Seattle Water Taxi is speeding up its schedule to help move people who are leaving work early, by having “quick return trips” back to downtown, transit officials said. Capacity is already more than double the usual amount, as King County added the privately-owned San Juan Clipper when Highway 99 closed for three weeks last month, and it remains in service. Gov. 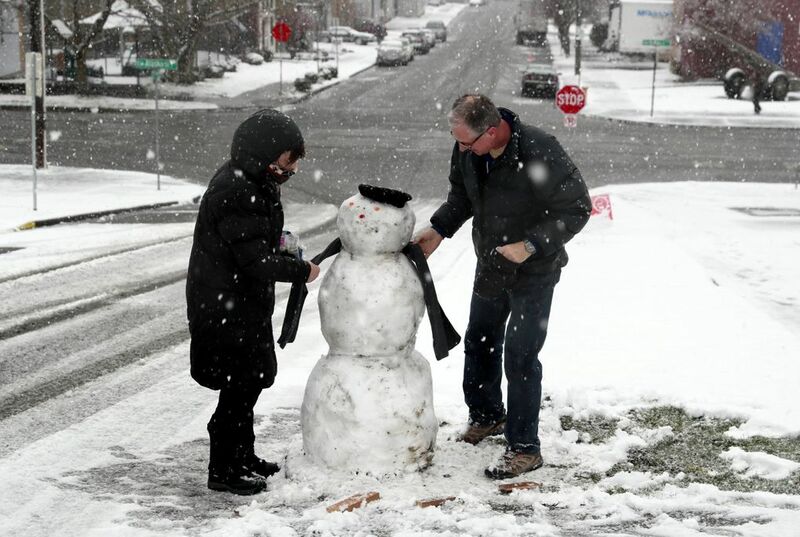 Jay Inslee has declared a state of emergency throughout Washington in response to the snowstorm. The state military department has activated the state emergency operations center, which will coordinate resources to help local officials during the storm. In an emergency declaration, Gov. Jay Inslee said that truck drivers who haul bulk milk or road salt are exempt from regulations that limit how many hours they may drive. These laws are meant to reduce fatigue and crashes. However, Inslee considers these items essential. He notes that milk both has a short shelf and is being quickly snapped up by residents. 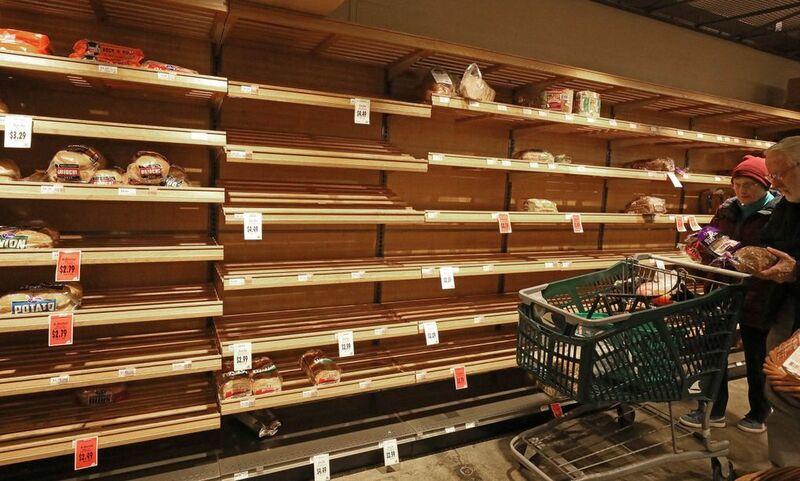 “Collection and delivery of bulk milk products is incident to the immediate restoration of essential food supplies and to supplement state and local efforts to save lives and to protect public health and safety,” according to the declaration. A severe weather shelter at the Seattle Center Exhibition Hall will remain open through Sunday night, according to the City of Seattle. The shelter serves people ages 18 and older and does not require a referral form. For families, a weather shelter is open from Friday night through Monday morning at the Garfield Community Center. Priority will be given to families with children and people living in vehicles, but anyone is welcome. Forecasts for severe winter storms have prompted the opening of more emergency homeless-shelter beds and outreach to the city’s of unsanctioned tent camps. The more than 5,000 people living outdoors in King County are the most in danger. For shelter, King County’s 211 service has experts of various services. For emergencies, call 911. 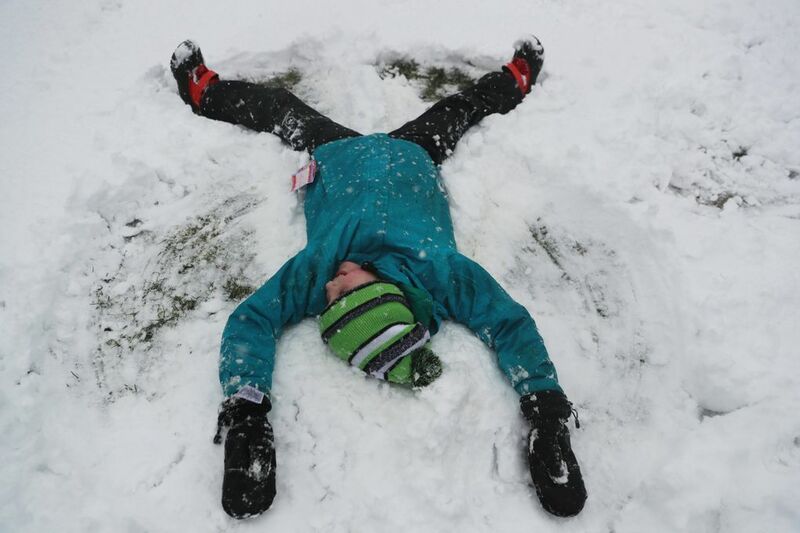 The frigid temperatures have already proven deadly. A 59-year-old man, who may have been homeless, died from exposure while at the Sodo light-rail station. A train operator found the man, Derek C. Johnson, sometime before 5 a.m. Thursday at the transit station. He had no permanent address. Some on social media have wondered whether Sound Transit should pause fare enforcement during cold and snow in order to allow people to warm up on board, even if they can’t afford a ticket. Sound Transit does not formally change its fare enforcement practices during weather events, said spokeswoman Kimberly Reason in an email. But “[we] do train our fare enforcement officers to use common sense and sound judgment in handling fare enforcement issues during unusual or severe conditions,” Reason said. Prepare for a long time in the car if you’re planning on driving. Travel times throughout the Seattle area are at least twice as long as usual, according to the state Department of Transportation. The drive from Lynnwood to Seattle — a distance of 16 miles — is an hour and 30 minutes, and Seattle to Lynnwood is an hour and 20 minutes. Redmond to Seattle is about two hours, and Seattle to Redmond is an hour. 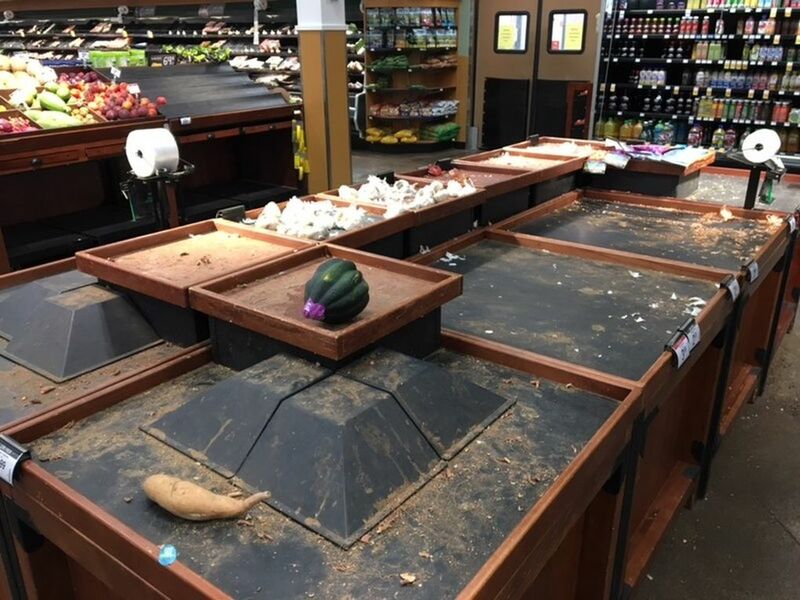 Local officials have asked residents of stay off the roads, stressing the severity of the storm. Local officials are pleading for residents to stay off the roads, as the city prepares for snow over the weekend. At a Friday morning press conference, which ended just minutes before flakes began to fall, leaders stressed the severity of the storm. Stay home, if at all possible, officials said. Check on your neighbors. If you have to drive, go slow, don’t ignore street closures and give snow plows a wide berth. Seattle Fire Chief Harold Scoggins urged people to be careful with home heating devices – don’t ever run generators or grills indoors, and even indoor space heaters often aren’t designed to run around the clock. 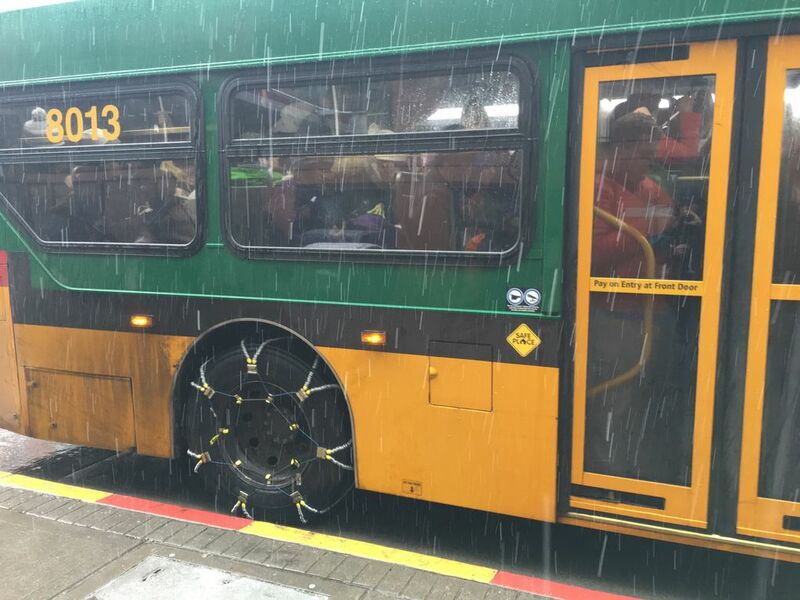 King County Metro will be putting chains on all its buses Friday afternoon, but with a bus system still recovering from snow earlier this week, service will be reduced, waits will be longer and buses will be crowded, officials said. “Metro will do everything within its power to maintain safe service levels,” Metro General Manager Rob Gannon said. The agency canceled all trips on 20 routes Friday morning. Gannon said they would make a decision late in the day Friday on whether to switch to their “emergency snow network” for Saturday service. That would mean bus service on only 60 core routes, down from more than 230 normally. 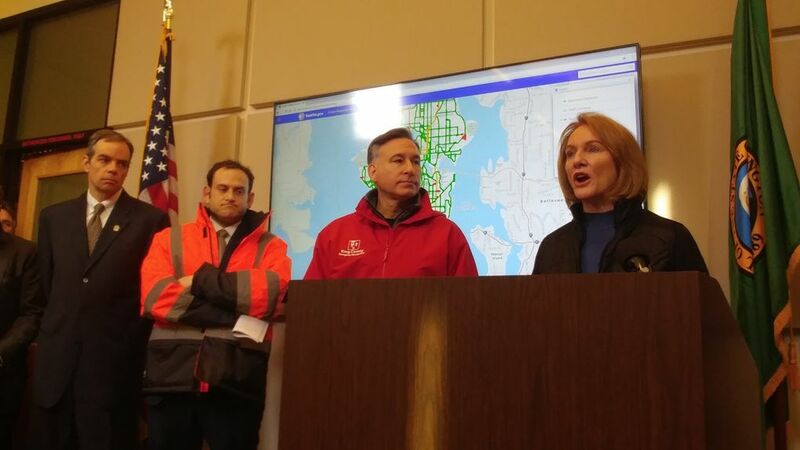 Sound Transit said it was confident in its ability to run light rail through the storm. When it snowed last weekend, the agency ran empty trains through the night (when it normally doesn’t operate) to ensure that tracks stayed clear of snow and overhead wires didn’t ice over. About 200 flights have been cancelled and 90 flights delayed at Seattle-Tacoma International Airport, according to FlightAware. Alaska Airlines said its “pre-cancelling” flights that were scheduled to arrive or depart from the airport this afternoon. The airline is also offering a flexible travel policy for those who would like to change their flights. Passengers flying to or from Seattle on Friday or Saturday can rebook or cancel their flights with no change or cancellation fee. Delta is offering a similar policy for passengers flying to, from or through Seattle, Portland, Eugene, Medford Redmond or Vancouver, B.C., airports. 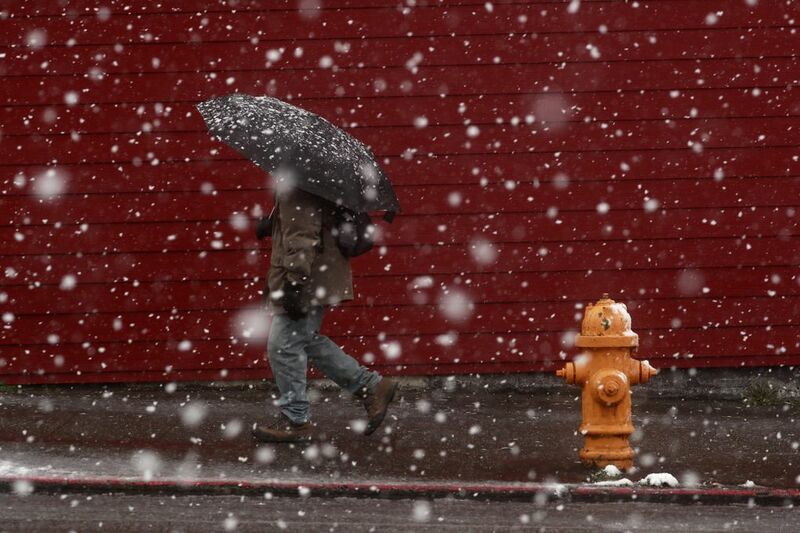 We’ve spotted flurries from the Times newsroom in South Lake Union. 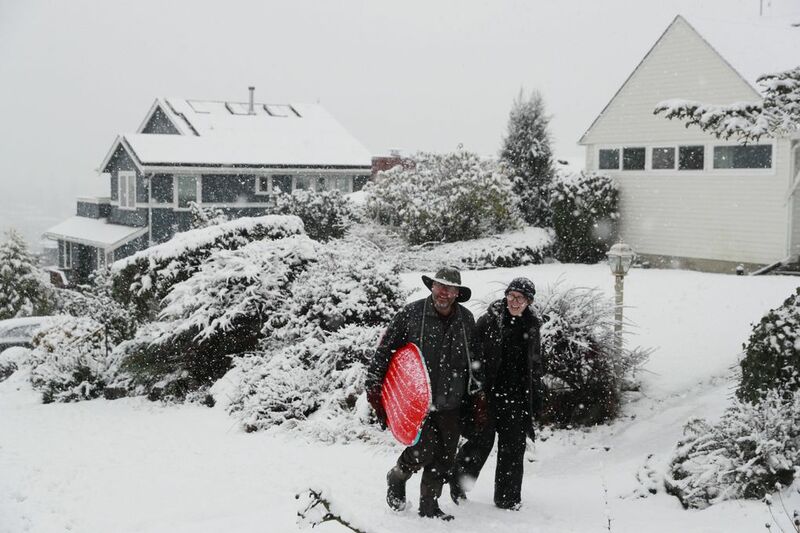 Meanwhile, 5 inches of snow has been reported on Camano Island, and 4 inches fell on Sequim in about two hours. More offices and organizations are announcing closures. King County Superior Court will close at 2 p.m., and the clerk’s office will close at 2:30 p.m. to allow attorneys and litigants to file paperwork. All City of Redmond facilities will close at 1 p.m and all Snohomish County administration buildings will close at 3 p.m. 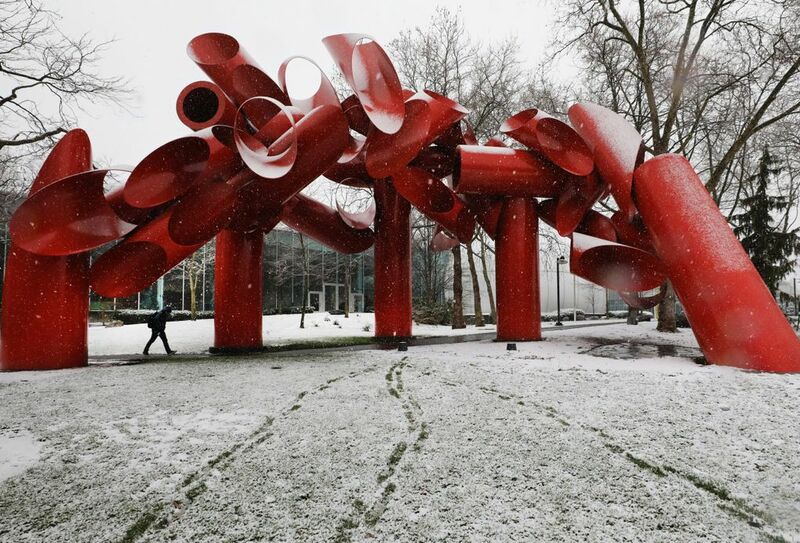 The Seattle Art Museum closed at noon and will be closed on Saturday. 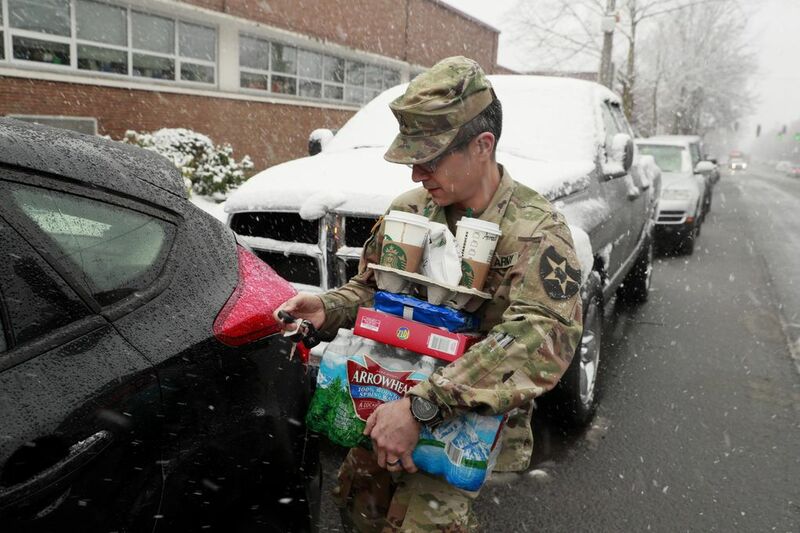 Joint Base Lewis-McChord is allowing all military personnel and civilian employees who are not designated mission critical or essential to leave three hours early. A full list of closures is available here. If you’re seeing sun in Seattle, enjoy it while it lasts, because it’s going to disappear soon, according to the National Weather Service. 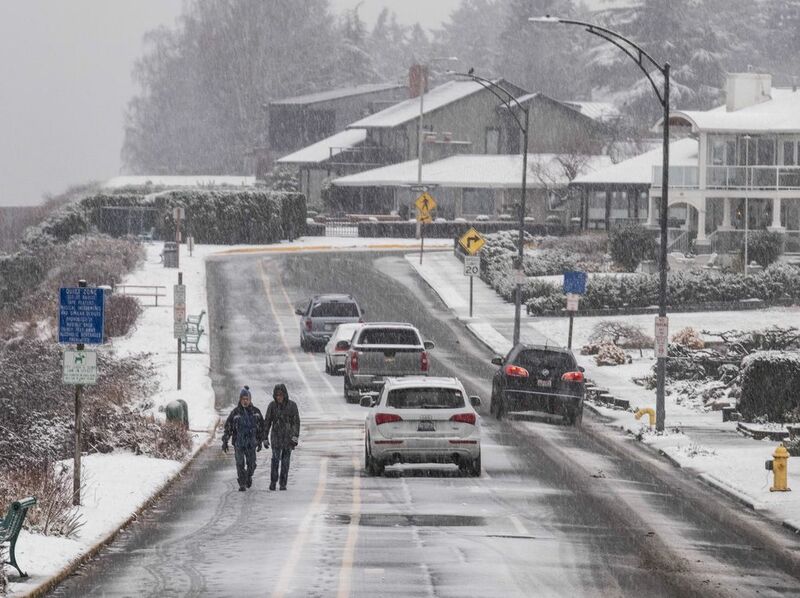 Several inches of snow have been reported in Snohomish, Skagit and Island counties, with 4 inches in Port Angeles and 2 inches in Arlington and Oak Harbor. 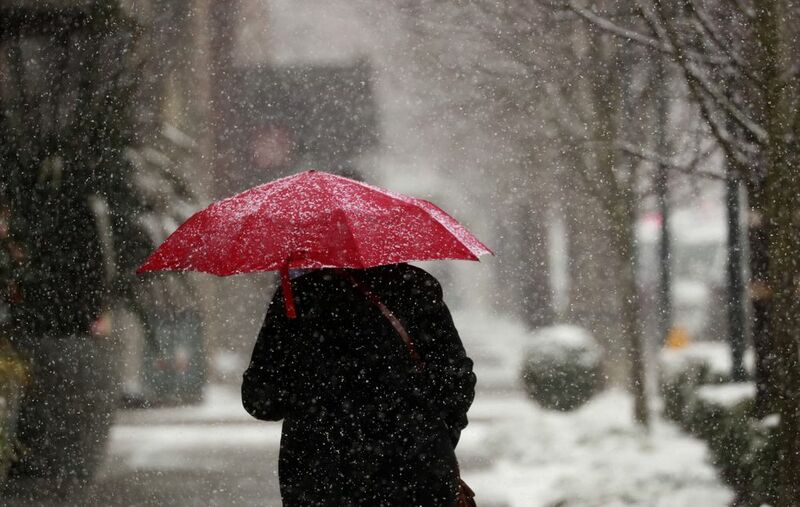 A winter storm warning remains in effect from noon Friday to 4 p.m. Saturday for the Puget Sound region. 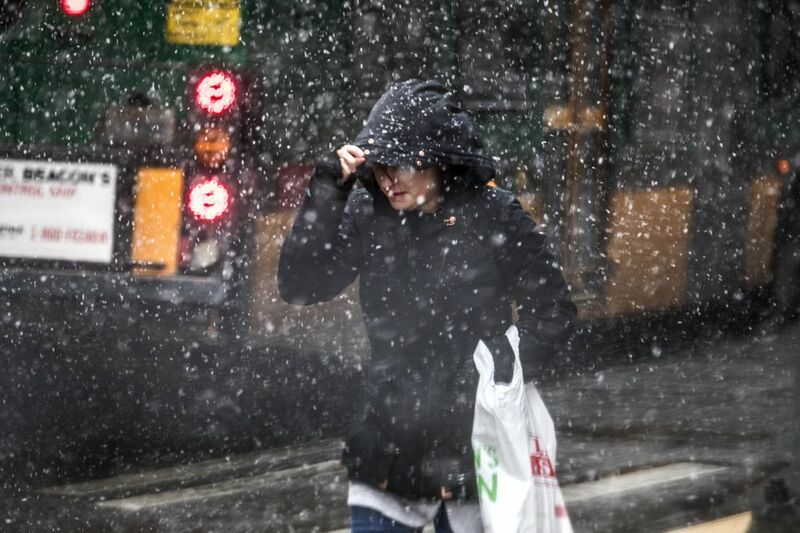 The heaviest snowfall will occur Friday night, according to the Weather Service. We’ll provide live updates of the weather outlook, commute and closures throughout the evening.